Former President Goodluck Jonathan has described Kaduna state governor, Nasir El-Rufai as a liar whose penchant for lying has even been confirmed by his former boss and ex-president Olusegun Obasanjo. Jonathan said this while reacting to a statement made by El-Rufai at the end of the national economic council (NEC) meeting in Abuja on Thursday, where he, El-Rufai alleged that Jonathan was partial in the disbursement of the ecological fund while he was in office. “What President Goodluck Jonathan did was to take N2 billion each from the ecological fund and gave to some PDP states. 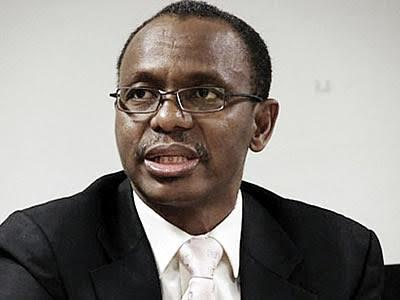 Any PDP state that was not his friend, like Kano and Kwara, didn’t get,”El-Rufai had told state house correspondents. Dismissing El-Rufai’s claims, Jonathan in a statement signed by his media aide, Ikechukwu Eze, said there is no truth in El-Rufai’s claims. “That Malam Nasir El-Rufai governor of Kaduna state has an incurable knack for lying has been proven by his own boss, former President Olusegun Obasanjo who described el-Rufai in his book-My Watch Volume 2 as follows: ‘Nasir’s penchant for reputation savaging is almost pathological. Why does he do it? He is brilliant and smart. I grant him that also. Very early in my interaction with him, I appreciated his talent and brilliance. At the same time, I recognised his weaknesses; the worst being his inability to be loyal to anybody or any issue consistently for long, but only to Nasir el-Rufai. He barefacedly lied which he did to me against his colleagues and so-called friends. I have heard of how he ruthlessly savaged the reputation of his uncle, a man who was like, in the African setting, his foster father. I shuddered when I heard the story of what he did to his half-brother in the air force who is senior to him in age. With such a description, we are not surprised at his recent comments after the just concluded national economic council meeting where he accused former President Jonathan of only sharing the national ecological fund to PDP states. It is so easy to expose Malam Nasir El-Rufai as a liar being that Akwa-Ibom, a PDP state governed by the then chairman of the PDP Governors Forum and a close confidante and major supporter of the then president, Senator Godswill Obot Akpabio, did not get the monies alluded to by Malam El-Rufai from the ecological fund as did multiple other PDP states including Ekiti state, a state governed by a thoroughbred patriot and Jonathan supporter, Ayo Fayose. Also, it is false that non-PDP states did not get monies from the fund. Nemesis catches up faster with liars than any other agent of evil. El-Rufai was probably led by the gods against his own sinister plot to confess in another breath that states under non-PDP parties like APGA and Labour party also benefitted. The fact remains that the ecological fund is a specialised fund with certain constitutional requirements which must be met before a state can access the funds. Every state benefitted from the fund under President Jonathan who bent over backwards to accommodate states that had difficulty meeting the criteria for accessing the fund. El-Rufai’s sinister narrative was intentionally silent on the over N10 billion specially deployed to fund the Great Green Wall (GGW) project in some northern states, in view of the need to work with the rest of Africa on the African initiative to check desert encroachment in the Sahelian states. These states included Zamfara, Jigawa, Kebbi, Sokoto, Katsina and Adamawa. Others are Yobe, Borno and Kano which belong to Mallam el-Rufai’s class of ‘non-friendly’ states that he alleged never benefitted from any discretionary fund. Similar principle applies to the conditions for accessing the Universal basic Education fund where some states have not had access to what is due them, because they are yet to fulfill the mandatory criteria for allocation. Would it then be right in the name of el-Rufai’s position on equity to blame the failure of those states to access their UBEC funds on Jonathan? Nigerians may recall that this is not the first time that el-Rufai has vented his known passion for lying against the former President. The public will recall that in October 2015 he falsely alleged that former President Jonathan spent a whopping N64 billion on Independence Day celebrations, during his tenure when in fact only N333 million was spent. Nigerians may also recall that this same El-Rufai falsely accused former President Jonathan and former CAN President, Pastor Ayo Oritsejafor of founding and funding Boko Haram to the tune of N50 billion.